This is a sweet top floor unit, with a private rooftop deck and views of Mt. Rainier. The flat has an interior stairway to your own sunny deck to BBQ. There's an extra west-facing window to peek at the commuter activity at the light rail stop. It has vinyl plank flooring, white quartz countertops, and stainless steel and Energy Star appliances including dishwasher and washer dryer. Easy access to bike parking off of the west stairway. 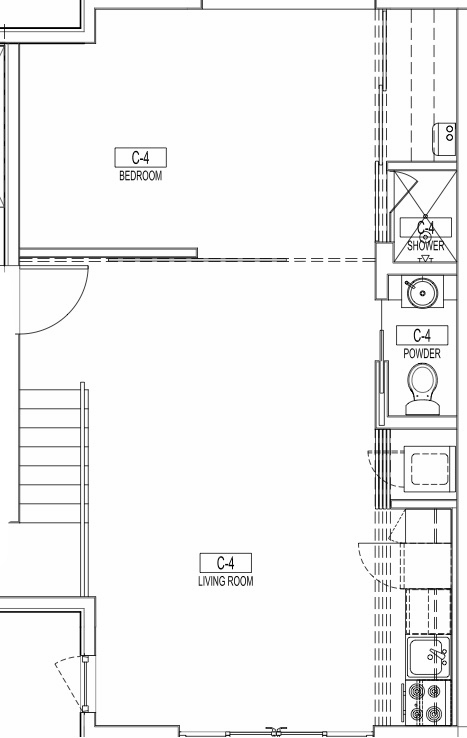 Above is a floor plan of the one-story unit and below is a floor plan of the rooftop deck. Rooftop deck to unit C4 includes landscaped planters with crepe myrtle trees.